Possibly the most significant emerging truism with respect to Portland's beer scene is you don't have to make good beer to serve or sell good beer. This is a result of the fact that we have a growing number of taprooms, growler fill locations and pubs that offer lots of great beer to stay or go. This likely would not be happening if breweries and brewpubs hadn't paved the way. The folks who pioneered great beer in this city built the foundation upon which the current craft beer craze rests. The obvious suspects in this regard are Widmer, Bridgeport, Portland Brewing and McMenamins. But an inclusive list would also recognize breweries that opened more recently. I just received word that a new growler fill station will open on Southeast Hawthorne in a couple of weeks. It's to be called Growlers Hawthorne and will be located at 3343 SE Hawthorne. Official opening is set for noon, Feb. 4. Their "under construction" website is here. 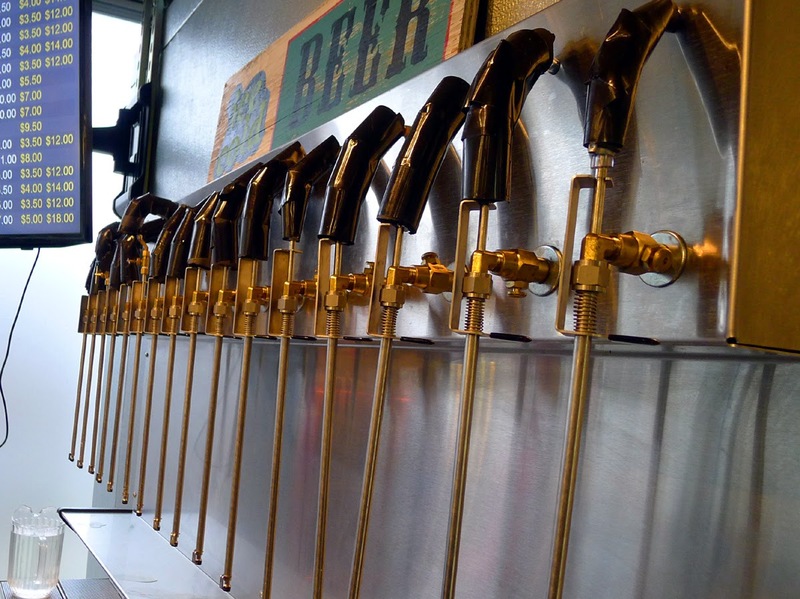 Growlers Hawthorne will have 40 rotating taps (beer, cider, mead), plus eight more taps pouring non-alcoholic drinks like kombucha. They have a weeklong grand opening planned, with exclusive beers and Meet the Brewer events featuring folks from 10 Barrel, Oakshire and Firestone Walker. It's going to be fun, no doubt. Something to keep in mind about Growlers Hawthorne is there will be no on-premise consumption, outside sampling. This is essentially a growler fill station similar to what you find in some grocery stores, mini-marts, etc. You get your container filled and you vamoose. That's in contrast to what we see with taprooms, where you can buy beer to consume there or take with you. Today's press release doesn't say it, but there's another place going in on Southeast Hawthorne and it will be a taproom similar to places like Tin Bucket (North Williams) and the Imperial Bottleshop and Taproom (Southeast Division). I don't yet know what it will be called or when it will open, But I know it's coming. Somewhere around 20th and SE Hawthorne, if you're wondering. It's not so hard to see what's driving people to open these places: Demand for great beer continues to grow. If you want to tap (haha) into that growth curve, opening a taproom/bottleshop or growler fill station is a relatively easy way to do it. Certainly far cheaper than a pub, brewpub or brewery. And easier to borrow money because startup costs and risks are lower. The elephant in the living room is this: How many of these places can the market bear? As usual, no one has an answer. While fizzy beer fizzles, we continue to see growth in craft beer numbers nationally, regionally and locally. The indicators are up. More shelf space in grocery and convenience stores appears to be occupied by craft brands. My opinion, for what it's worth, is this: There are plenty of areas in this city that remain woefully underserved in terms of taprooms or growler fill stations offering a range of quality beers beyond what you might find in a nearby brewpub. I count my own neighborhood (Rose City Park) as being on that list. I suspect we will soon have a growler fill station or taproom of some sort nearby. The Hawthorne corridor already features a number of places where you can get good beer. Beermongers and Apex aren't far. Blitz Ladd fills growlers and isn't far. But there's a hefty amount of pedestrian, bike and commuter traffic through there. And there's a large and growing residential community. My bet is these new places will be supported. Time will tell. Nonetheless, we will eventually reach the saturation point. That will happen when we have multiple retail locations (stores, taprooms, pubs) in an area offering growlers fills and specialty bottles. At that point, they will cannabalize each other's customers. We aren't there yet and it may be a while for most parts of the city.